Made in European wool, this minimal silhouette features modern details like a slight V-neck and black inserts under the arms — perfect for stressful (i.e., sweat-inducing) convos with your boss. Made in NYC. Straight fit that skims the body. Our model is 5’9” and wearing a size 4. Runs slightly small; if you are in-between sizes, we recommend sizing up. Armhole re-shaped for maximum comfort and coverage. Bust dart adjusted to best fit a fuller chest. Curve of hem reshaped so that it can easily be worn untucked or tucked-in. Our model is 5’11 ½” and wearing a 14W. For more details about the fit of our extended sizes, please visit our page About Extended Sizing. 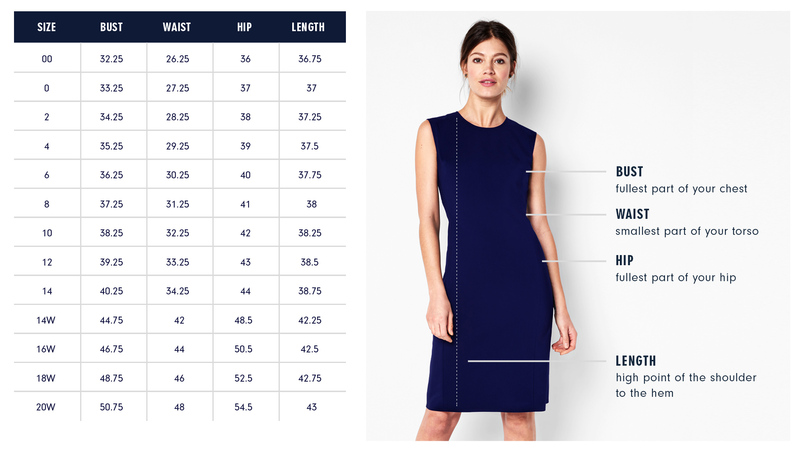 Below are the exact measurements of the Hudson Dress. All measurements are in inches. For general brand fit, sizing, and measurements, please visit our Brand Fit & Size Guide. Straight fit that skims the body. Hemline falls just above the knee. I was inspired by the minimal aesthetic of 90's fashion when designing this dress. My favorite element is the black insert under the arm. It's a modern, subtle detail and has the benefit of disguising sweat stains! Our go-to for: A first-round interview in a conservative office.